Here she was again. At this damned stream looking for these damned fish. This was something that she wasn't at all happy about, but the tabby women knew she wasn't capable of taking anything too big down on her own. As much as it was annoying, fishing was her best means of catching anything worth while. Sighing heavily, the small woman settled up close to the edge of the stream, her features grim. 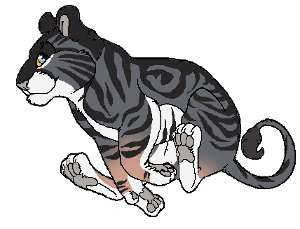 Claws flexed, ready to pierce annoying scaly flesh and swipe up. Aqua eyes focused, suddenly she sees a rather big fish in the shallows. With a determined growl, she swings her paw and attempts to swipe it out of the water, using her claws to latch on and help with this endeavor. Surprisingly, her paw meets the thick, heavy form of the fish. She can feel her claws sinking into it's body as the momentum of her paw forces it out of the water and onto the shore beside her. A surprised gasp escapes her lips, her aqua eyes wide with joy. Tail wiggles behind her excitedly, happy that she was able to finally catch something without her entire body being involved. Turning she placed a paw on the large salmon and pressed a claw into it's eye. It flopped a bit before finally dying, a mix of what she'd done and suffocation taking hold. Grinning from ear to ear, Maximelia looked back warily to the water - contemplating trying again. She couldn't go home with just one fish after all. Shifting back to the water the tabby let out a heavy sigh and poised her paw once more. Watching the waters intently, her brow furrowed and she expelled her breath slowly, willing herself to catch another. The process repeated as she saw another juicy red salmon swim on by. It seems as if her luck was not with this swipe, but her paw wavered as it hit the water, slipping into it at a weird angle, scaring the fish off. A disgruntled grunt ushered from her lips and she settled her paw in front of her again, taking a moment to calm herself. No, she couldn't get upset. She had to focus and fish. These stupid scaly creatures couldn't defeat her again. Not when she had a pride to provide for. Shuffling in place, her muscles twitched and grew taunt. Paw rose, readying to swipe once more - claws flexing. Finally, she angled her wrist just right so her paw would slice through the waters, hoping to latch onto an unsuspecting fish again. 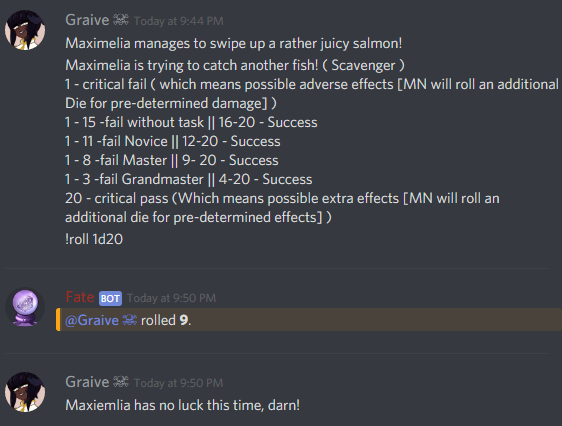 Maximelia fails horribly. Her other paw seems to not have any grip on the edge of the waters and it causes her foot to slip into the water, pushing her other paw into the water as well - missing the fish. Her face nearly meets the water, nose hovering just above it. Aqua eyes are wide, her heart pounding in her chest. Another mistake, this time, it wasn't the fishes fault. Gritting her teeth, the usually patient woman shifts up and adjusts herself back onto the edge of the stream. Huffing softly, she paused a moment, catching her breath. It was difficult, having patience with this. Fish seemed to always elude her. She wished it was as easy as looking for herbs. But alas, the woman could only continue to try. Making sure her body was steady and balance, Maximelia rose her paw and swiped to try again. maman was out and about and had a little mini me following her every step. Young woman stalked after her mother, wondering what exactly she was up to. As she neared the steam, she spied her mother fishing. Ah, so she was providing for them. There was already a fish to the side and the youngster licked her chops. mmm. Except, as her mother tried again, she misses, and ungracefully tips towards the water. A gasp escapes the girls lips. Since when did her Maman stumble? Then as her mother recovered she started to giggle, her slightly smaller form coming alongside. 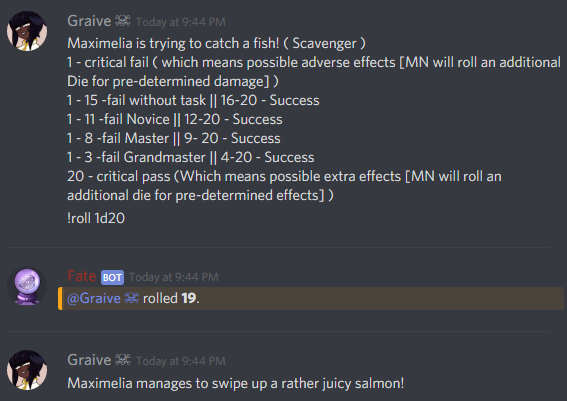 Maximelia finds herself swiping up another fish. Excitement bursts through her, heart rapidly beating in her breast. She lets out a soft sound of glee as the red creature is thrown onto land next to the previous fish. At this, she notices Persephone and blinks, her face would be beet red if at all possible. Had the little one seen her near accident into the waters? By her delightful little giggles, the Anima Empress could only assume yes. A smirk touched her lips and she leaned over to press a kiss to the top of her head, "Yes, yes, laugh it up, ma petit. I would like to see you give it a try next." She teases, motioning with one paw toward the waters. The small girl comes along side her maman as she scoops up another fish. One that promptly bounces off the young girl's breast before falling next to her mother's prize. She jumped back and laughed all the harder as she curved her skull to wash the grease left behind on her pelt. Pink tongue, the same shade as the fish, worked hard, ears tilted towards her maman as she spoke. She snorted, looking up as she finished. "I will maman. And quit calling me small." she tells her mother primly as she trades giggles and smiles for seriousness and concentration. Watching the water for the tell tail sign of silver and pink, a salmon swimming upstream to spawn. Ahah, there was one. So the young girl attempts to catch the fish, slapping her paw into the stream. Determined to upstage maman. Maximelia watches the young girl intently, though her giggles and amusement seem to make the Anima woman all the more thrilled. Despite her embarrassment, it was wonderful to have time with her children, teaching them important things. Things they would need to know growing up. Features turned as Persephone poised to catch the fish. She waited with baited breath to see how she did. The girl's strike is successful, claws sinking into scaled flesh as she pulls it from the stream. It lands, flopping beside her, and she turns her gaze towards her mum, brows raised. See, told you I could do it." she states, pride evident in her voice. Then she turns back to the scaled animal and pins it down with one paw. Keeping it from escaping, she leans down and bites into it. Deciding that now was a perfectly good time to enjoy her fairly won prize. "Persephone, I was catching these for the cache, though I suppose a small snack will do." 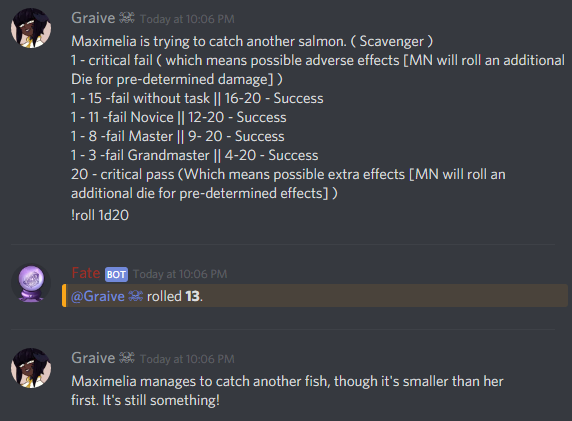 Maximelia turns to look at the two salmon she'd caught, pride in her chest - and also in the fish that her daughter had caught. Shuffling up, the tabby woman stands to nuzzle the side of her daughter's cheek as she munches on the fish. "I do not call you petit because you are small, it is because you are my baby." She mused warmly, offering a kiss to the lavender babes head. 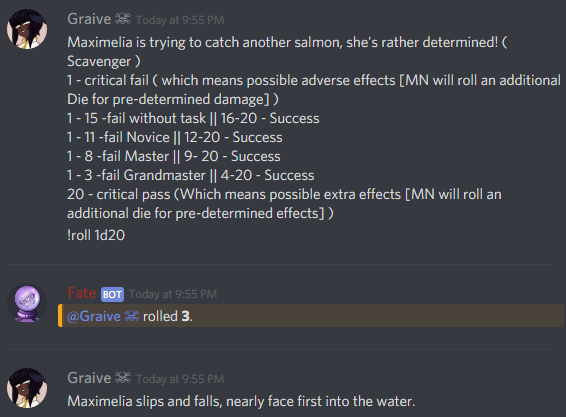 Turning to look at the waters, the Anima Empress decided to try her hand at another fish, just to see if three were a lucky number. 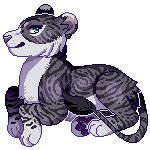 Paw rose, claws extended and she swiped. Maximelia caught herself one fish, but it seemed it was being eaten by another! A big bundle! She smiled and hummed. Turning she would gather up those fish and usher Persephone to grab hers. "Come along, let's get these back home!" Dice roll here + reward!